Some pet owners can’t imagine not sleeping with their fur babies in the bed; others are convinced that sleeping with their pets in bed with them is a bad idea. 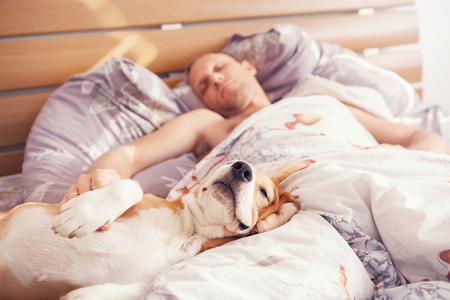 Whether it’s just comforting to snuggle with your pet at night or you simply can’t imagine not having him with you every moment, there are actually several good scientific reasons why you should sleep with your pet! This is an interesting article, and I really like your graphic. I recently read an article about different nationalities and this topic. Apparently Americans sleep with our pets more so than in any nation. I’m not surprised to hear that Americans sleep with their pets more than others. We treat our pets as children or our “babies,” while many other countries don’t see pets in the same way. I know my dog and cat are MY babies!